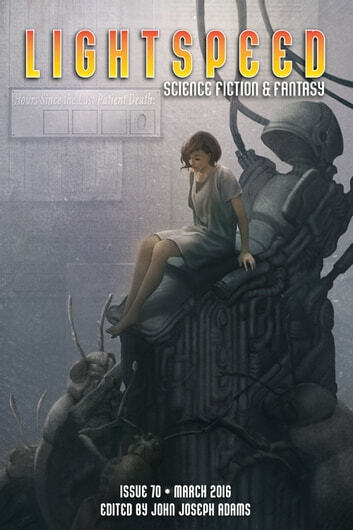 This month, we have original science fiction by Caroline M. Yoachim ("Welcome to the Medical Clinic at the Interplanetary Relay Station") and Craig DeLancey ("RedKing"), along with SF reprints by Timons Esaias ("The Mars Convention") and Aliette de Bodard ("The Waiting Stars"). Plus, we have original fantasy by Rich Larson ("Sparks Fly") and Marie Vibbert ("Michael Doesn't Hate His Mother"), and fantasy reprints by Andy Duncan ("The Premature Burials") and Seanan McGuire ("Rat-Catcher"). All that, and of course we also have our usual assortment of author spotlights, along with our book and media review columns and a roundtable interview on the Star Wars canon. For our ebook readers, we also have an ebook-exclusive reprint Mark W. Tiedemann's novella, "Miller's Wife." And for our novel excerpt this month, we're proud to present a preview of Hugh Howey's novel, SHIFT, out now from our editor's new book line for Houghton Mifflin Harcourt, John Joseph Adams Books.